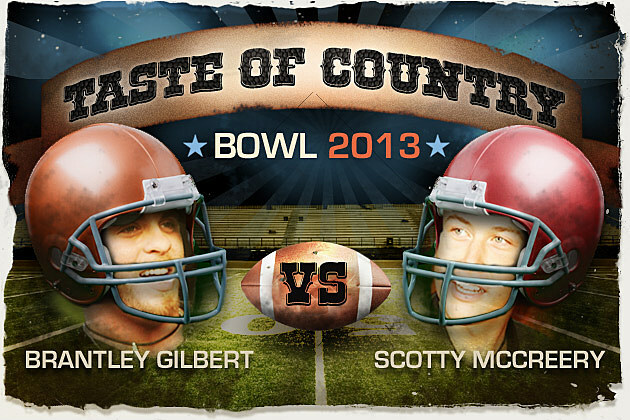 The Round 2 matchup between Brantley Gilbert and Scotty McCreery may break the internet. The two artists have very different fanbases — both willing to stand up and be counted again and again. If this Taste of Country Bowl pairing was a real football game, each play would fall in the “three yards and a cloud of dust” variety. Who can score the winning touchdown? Gilbert and his fans proved they’re a force to be reckoned with by doubling up Miranda Lambert and her followers last round. Luke Bryan and his team were persistent, but McCreerians used social media to make sure Team Scotty stayed out in front. The winner of this Round 2 matchup moves on to the semi-finals to face either Taylor Swift or Lady Antebellum. Voting for all Round 2 matches will end on Sunday, Jan. 20 at 11:59PM ET. Vote up to once every hour until then.